In today’s ever-changing retail world, one thing is certain: the more places you’re selling, the better your chances of consistent revenue. Of course, being everywhere is easier said than done. While you’ve likely heard of (and may be engaged in) multi-channel selling, “omni-channel” is the latest buzzword sweeping the retail industry. But what is omnichannel retail, and more importantly, what is the difference between the two?Multi-channel retailers sell products through more than one channel, which may mean leveraging their own ecommerce site, a brick-and-mortar store, Amazon and eBay. While omni-channel retailers may set up shop on those same channels, the real difference lies in marketing strategy. Multi-channel retailers focus on leveraging the channels themselves, aiming to spread the word about their offerings to as many places as possible. An omni-channel strategy brings the focus back to the customer and providing a seamless shopping experience as they move among channels. Taking an omni-channel approach is more vital than ever before. According to the National Retail Federation, 51% of Americans prefer to shop online, while 49% favor shopping in-store. With a nearly even split of shopping preferences, retailers need to ensure they’re providing a uniform, branded and user-friendly shopping experience that transitions seamlessly between online and offline channels. But how do you achieve this? Follow these five tips to create a holistic omni-channel experience that will keep your customers happy, loyal and converting, regardless of where they check out. 1. Create a consistent brand experience across your entire enterprise. Though your target audience may vary by channel, it’s important that you still provide a consistent and unified brand experience. Make sure your voice, tone and design are consistent across channels, so that customers will recognize your brand when they see it in different places. Metallic accessory brand Flash Tattoos makes a consistent, bold brand statement with their imagery in the numerous places customers can find them, including Instagram, Facebook, their webstore and even Amazon. This strong branding helped Flash Tattoos grow quickly through social media sharing, with easily recognizable photos portraying the brand’s signature metallic temporary tattoos on the bodies of young, bohemian-styled women. The team behind Flash Tattoos is aware that they are selling more than a product — they are selling a “vibe,” and this is what has helped them become the premiere brand name in temporary tattoos for young travelers and festival-goers. 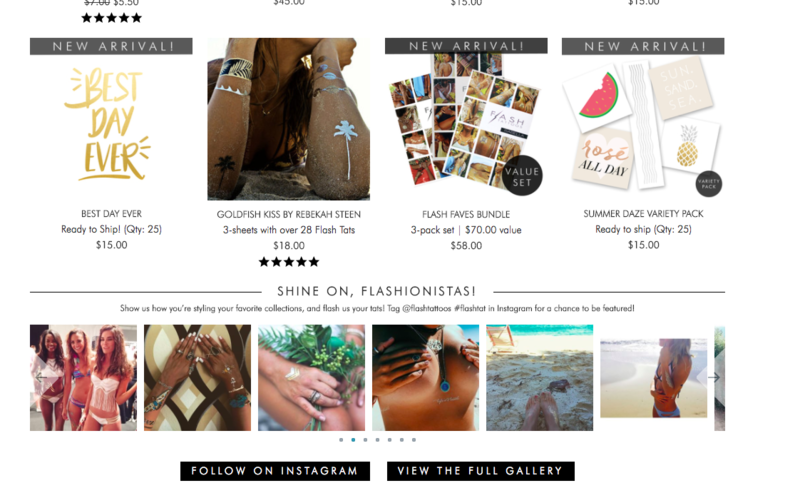 Flash Tattoos maintains a consistent look to their brand imagery, using close-ups of their tattoos on Millennial women and lifestyle shots of the women at the beach or other fun locales. 2. Make shopping with you seamless across all channels. With so much competition in today’s retail space, the brands that can meet their customers’ needs consistently in a variety of situations will come out ahead. Some customers may view an item online and decide to visit your brick-and-mortar to see it in real life before deciding. Others may start their buying journey on one device and switch to another before converting. This winding path to purchase is more common than you may think. A study by Ness Software Engineering Services found that 84% of shoppers interacted with brands online before visiting their brick-and-mortar counterpart, and another 25% who started shopping on a PC switched to a mobile device or tablet before making a decision. Because it’s so easy for users to put down their device without making a purchase, it’s imperative that shopping with you is intuitive, in terms of browsing, finding specific products, checking out and accessing customer support, regardless of where the customer begins and ends their buying journey. It’s also important to track where customers are entering, converting and exiting the buying process so you can use that data to craft customized experiences based on those behaviors. The goal is to make customers feel they can count on you to know and meet their needs. Buyers who feel they had a great user experience will be more loyal to your brand. Gourmet gift brand Di Bruno Bros. faced a distinctly difficult challenge: conveying the quality of their food products in an online format, where shoppers didn’t have the chance to smell, sample and handle the food. 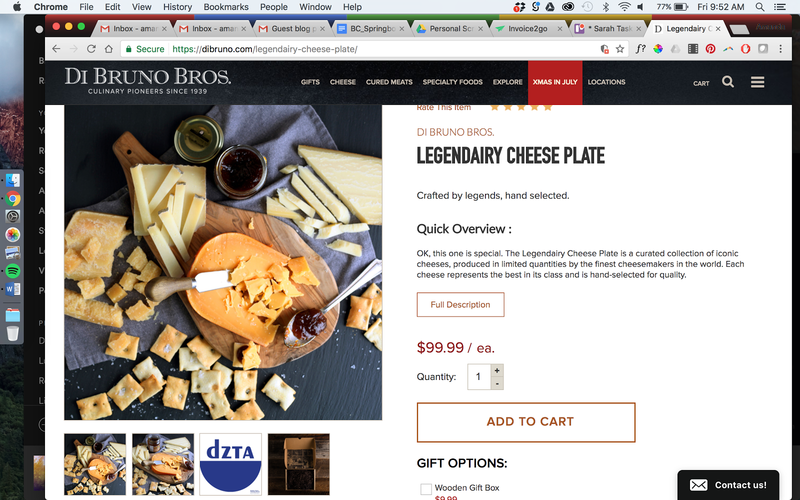 Di Bruno Bros. worked with BigCommerce to build a custom site with a particular emphasis on responsive design for their 40% of online shoppers who shop on mobile devices. The updated, photo-heavy site features large, attractive images of the products, divided into categories that make it easy for customers to find the taste they are looking for, mirroring the way they would browse the cheeses and meats in-store. The new and improved site showed immediate ROI for the brand, who experienced a 63% increase in conversions and 6.5% boost in online sales. Di Bruno Bros. uses stylized, detailed images to draw customers in while also giving them an accurate look at what they’re buying. 3. Optimize your inventory management. With orders coming in from so many different channels, optimizing your inventory management should be a top priority. You need to ensure you are placing the product where the demand is, and are also able to deliver on that demand. With omnichannel sales, products are moving throughout channels, both as they are sold and as they are returned. This can make it challenging to keep up with inventory manually. Make sure you choose a POS software that automatically updates inventory across all channels in real time to eliminate the chance of overselling or other fulfillment errors. Your system should also be flexible enough to allow products to “flow” seamlessly across channels, for example bringing in products from one channel to another to avoid selling out. It should also know how to accept and properly register an in-store return even if the customer bought the product from an online channel. Most importantly, your POS system should hold all of this information in one central location so that you can easily keep tabs on your various channels, list products or make bulk updates, and manage fulfillment and returns from one place. 4. Know your customers top to bottom. The changing retail landscape also means retailers need to be agile and responsive to customer needs. This requires leveraging customer tracking to know which channels each customer is using, what actions they’re taking, and what prompts them to make a purchase or abandon their cart. This can be easily done by setting up Google Analytics tags on each of your channels or configuring the dashboard within your ecommerce platform. Once set up, your analytics programs will automatically track the flow of traffic, as well as any specific key performance indicators you set up. Once you’ve got data on who your customers are, you can segment them into different audience groups based on their needs, product preferences and hobbies. One easy way to segment your audience is by taking generational preferences into account. Though consumers of all ages shop regularly both in-store and online, they respond differently to messaging and promotions, interact differently with platforms and are drawn to different user experiences. While Baby Boomers respond most to coupons, promotions and overall price to make purchasing decisions, Gen X favors the brands that acknowledge and reward their brand loyalty. Though both of these elements do affect Millennials’ decisions on some level, that cohort is most driven by peer reviews and online opinions, as well as the story behind the products or brands. Generational distinction is merely one way of many you can choose to segment customers. It’s important to note that customer preferences and needs can change over time, so make sure you’re segmenting your audience flexibly and evolving as they evolve. Infant clothing brand SpearmintLOVE utilized the power of audience segmentation to grow their revenue by 1,100% in one year alone. When the team realized their Facebook ads weren’t as effective as they liked, they dug deeper into their data and noticed their audience was more segmented than they thought – the needs of a mom-to-be and a mom with an 8-month-old baby are different. By recognizing their ads needed to grow along with their customers’ children, SpearmintLOVE was able to begin offering exactly what their customers needed at the right time. 5. Make holistic data-driven decisions. With multiple channels comes an influx of data. But if you don’t analyze and make smart decisions using data from all of your channels, you can easily be led astray. The analytics tool you choose should capture data from every channel and bring it into one dashboard. You should also set up your software to measure which channels and individual products are generating the most demand and by whom. Make sure you aren’t only paying attention to the channels that are most profitable; if you can’t keep a product in stock on Amazon but no one even glances at it when they visit your brick-and-mortar, it’s important to consider why that might be the case. 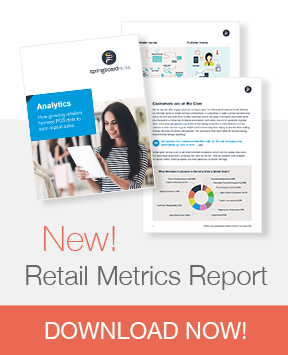 Dazadi, a game room outfitter, learned the hard way that making business decisions without viewing analytics holistically can result in expensive mistakes. The brand’s initial strategy was to sell as many products in as many places as possible, resulting in a loss of $1 million in one year due to lack of sales during the recession. The team took a step back and analyzed their data to find that Amazon was their only channel driving revenue. They scaled back their operations to perfect their Amazon strategy, focusing on what was selling and why. The team learned enough that they were later able to re-open their online store, this time in a much more strategic and successful way. Going omnichannel may seem like a lot of work, but having a seamless tie-in between your POS and ecommerce software platforms will help you automate many of these tasks after the initial setup. If you’re already a multi-channel retailer, it won’t take much to reach the next level as an omnichannel powerhouse — it all starts with recognizing the way customers shop, then enabling them to do so as seamlessly as possible! In search of more specific tips? Check out BigCommerce’s complete guide to selling online. New to BigCommerce? Try it for free and get 2 months FREE when you sign up!